Shark Navigator Vs Rotator- Which One is The Best Vacuum? Shark is a well-known company for vacuum cleaners, a sister business of Euro-Pro company. From its beginning, the brand is providing the best quality vacuum cleaners to the household and professional purpose. Shark Navigator and Rotator vacuums are two major types of series of the brand. 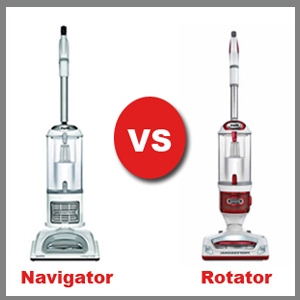 When you want to buy a vacuum of the brand, you need to compare shark rotator vs navigator. Both of the series are enough good to clean the home properly. However, there is some differentness in quality and performance level. Therefore, you will need to compare Shark Navigator vacuum with Rotator models. Then, you can decide whether you should buy a Navigator vacuum or Rotator vacuum for your home! This is important to compare Shark Navigator vs Rotator in order to decide and buy the best model for your home. Therefore, we have picked the best Navigator and the best Rotator vacuum of Shark Company to compare. As a result, you can easily get an idea about the vacuums performance as well as draw an easy conclusion. We have selected the best Amazon seller Shark NV501 vs. Shark NV356E to compare the models. With the advancement of the technology, there are different models available in each of the type. Therefore, we will discuss and compare on some common facts of the vacuum cleaners. As a result, you can easily understand the value of the performance and decide to buy the most suitable model for you! Most of the vacuum cleaners are powered using a cord; the length is varied model to model. However, most of the vacuums offer 30 feet cord in order to clean big spaces in home or office very easily using one power source. On the other hand, the cords are easy to bend and it will not affect the power. When you will consider the power limit of the Navigator and Rotator models, you will find that maximum models run at 1200 watts power. Therefore, the power is same and gives a good way to work. Do you prefer to work with using lightweight items? Then, the Navigator models will provide you easy to work. This does not contain many wires in the body. Moreover, the dust container is easy to empty and large enough to support you for a long time. The Rotator wins in the shark Rotator vs shark Navigator battle when you will consider to clean stairs and tight areas. The easy to use option of the Rotator models can give you easy to operate. All the vacuum cleaners provide multiple numbers of attachment and accessories to the users. Therefore, this is little bit different and complicated to decide on attachment and accessories. The Navigator package provide a good brush roll for carpets, a good attachment brush for pet hair removal and a good quality attachment head for hard surfaces. Both the Navigator and the Rotator vacuums provide all types of floor cleaning and carpets. However, you will get good performance from the Rotator devices. In fact, the model has developed highly in the suction department. Moreover, they are very efficient enough to clean any complex surfaces. The Navigator vacuums do not provide much detailed information in the suction power. Moreover, you will get not enough details of the technical department. However, they will always give you an average service quality very easily. The Rotator devices are available in very high quality and the price depends on the quality and advanced features. Every user of the vacuum cleaner like to have a portable option in order to move the device very easily to one place to another. The portable option is very much important especially when you want to clean sofa or stairs properly. Both the Navigator and the Rotator vacuum cleaner provide portable option. Moreover, the Lift-Away pod weight is also almost same for the users. Depending on the available models in the market, 14 lbs is an average weight for the canister of the vacuum cleaners. Which Vacuum is the Easiest to push around? This is very hard to decide which vacuum is the easiest to push around and operate for cleaning home. Both of the models are developed heavily in order to work properly. When you Navigator comes with bigger dust cup and easy to empty, the Rotator vacuums provide well designed dust cup. However, the digital screen of the Rotator vacuum cleaner is extremely perfect and easy to select the type of the surface. For that reason, working with the Rotator vacuum is very easy and simple especially for the beginners. Comparing the shark Rotator vs Navigator reviews is also an important factor to think about. When you will read the shark Navigator vacuum reviews, you will find a good satisfaction of the customers. However, most of the customers prefer the Rotator vacuums because of its attachments, special digital screen too easy to operate option! It’s hard to decide, which model is the winner in shark Navigator vs Rotator war. The performance, quality, ease to use and attachments promote both of the models. According to our researched and opinion, Shark Rotator is the winner. Most of the users are considering purchasing the Shark Rotator vacuum cleaner for home because of the special attachments and digital screen. Therefore, we are recommending the Rotator model! Compare Shark vs Dyson – Which One is Best For You?